UPDATE: As of January 24, banners directing readers to the Facebook campaign are no longer showing up on Freedom Daily, Conservative Today, or Joe For America’s pages. The banner still appears on Barracuda Brigade’s site. But the link to the campaign is broken, as are the campaign links from the other fake news sites. The campaign’s page is available via Google Web Cache. A network of fake news websites is promoting an effort to bypass new changes Facebook has recently implemented. The move comes as two major Facebook pages tied to the network and associated with fake news website Freedom Daily were taken down this weekend. Facebook has announced changes over the past couple of weeks that will push content from peers and supposed “high quality” news outlets higher in users’ news feeds. In response, this network of fake news websites including Freedom Daily, Barracuda Brigade, Conservative Today, and Joe for America have been promoting a campaign to circumvent Facebook’s newest efforts to tackle fake news, calling Facebook’s reasons to do so “insidious” and “anti-freedom.” The campaign claims that social media companies are trying to “eliminate [their] voice in the political arena” and that Facebook has “tried various tactics to kill these conservative websites.” The campaign encourages readers to adjust their settings on their Facebook news feed so that the pages of these conservative websites appear first on their feed. This setting would mean these users will see posts from these fake news sites on their feed regardless of how Facebook’s algorithm would otherwise rank their content. This campaign comes as the main Facebook page for Freedom Daily, a major fake news website, was recently taken down. The page had around 2.6 million followers and was verified until recently, when Facebook removed its verification check marks from the pages of multiple fake news websites. Freedom Daily’s content has often pushed racist conspiracy theories and promoted violence against Muslims. On its website, Freedom Daily’s Facebook icon now links to a new page, Freedom Daily News, which uses the same URL as the previous Facebook page and which began posting on Monday. The page seems to have been created around January 20, 2018. 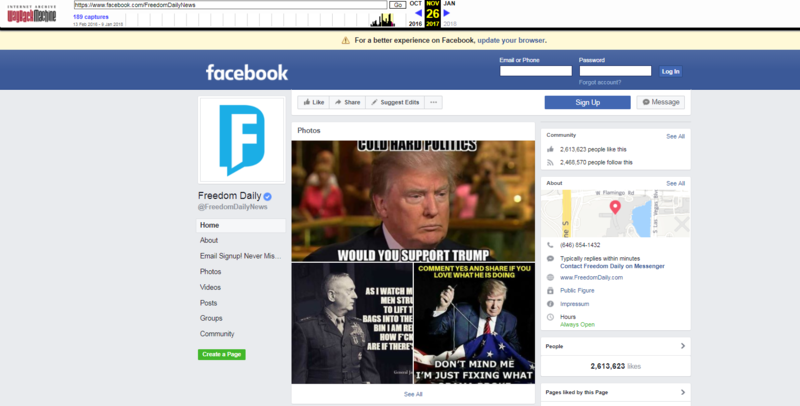 Freedom Daily’s main Facebook page was part of a network of pro-Trump, conservative Facebook pages that exclusively linked to a set of websites affiliated with Freedom Daily, such as US Herald, Constitution.com and Silence is Consent. The websites involved in this Facebook effort also shared a Google Adsense ID until recently, and have been promoting each other’s websites on their respective Facebook pages. 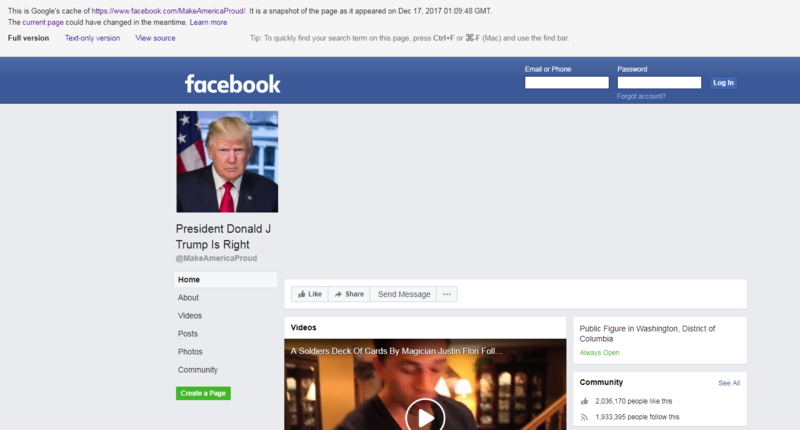 In addition to Freedom Daily’s page, another one of those pages called President Donald Trump is Right, which had around two million followers, is also down. All other pages associated with Freedom Daily are still active, but they seem to be operating differently since Facebook has deleted other pages. Major pages with millions of followers, like Patriots United, Daily Vine and Silence is Consent, have largely stopped posting links from Freedom Daily’s site, instead sharing posts from smaller Facebook pages and the pages of individuals linking to Freedom Daily. Some other Facebook pages which frequently posted links to Freedom Daily — Defense of Freedom, Conservative Tradition, Liberty Upheld, and Joe the Plumber’s Facebook page — have stopped sharing links to Freedom Daily on their pages all together.